Steinway & Sons pianos have long been considered the best pianos in the world, and while many people know this, not many people know why. Though every aspect of Steinway’s creation process contributes to the magnificence of its pianos, there are a few key features that stand out. As the second part of our blog series, this post will talk about the action parts of a Steinway and why they are crucial to the Steinway piano. Though it might be a bold claim, it is factually true. Lab tests have proven that the keys of a Steinway repeat 13% faster than the keys of any other piano, and with that increased rate of repetition comes a more sensitive and responsive keyboard, something that can be tangibly appreciated by pianists of any level. Lets take a look at how Steinway achieves this. Steinway’s Accelerated Action is largely reliant upon two design elements: a half-round balance rail bearing, and a special method of weighting the keys. 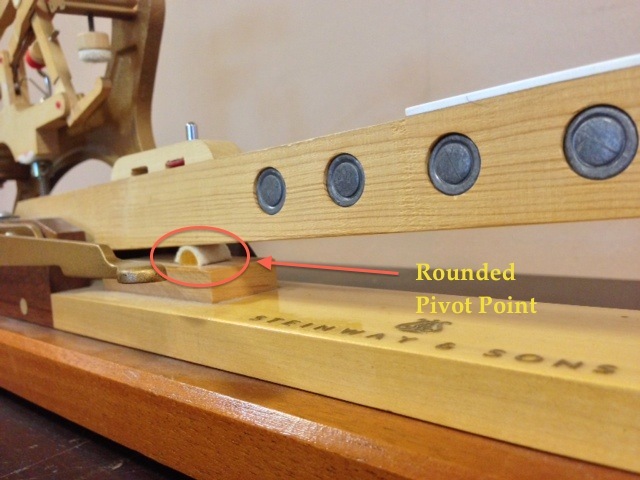 The balance rail bearing in a Steinway is a rounded, felt-covered piece of maple. It acts as the fulcrum on which the key pivots. Though this might seem like a trivial aspect of the piano, it is in fact one of the most important. No other piano uses a rounded surface; all others are flat. The significance of this becomes apparent when you think of it like this: Imagine a seesaw with a lightweight person on one end, and a heavyweight person on the other. The heavyweight person represents your fingers, and the lightweight person the hammer mechanism. If the seesaw were pivoting on a flat surface, there would be no way for the mechanism to easily tip from one point to the other. Yet seesaws pivot on a rounded surface, allowing for the mechanism to tip freely from one end to the other. Therefore when the heavier person gets on the seesaw (your fingers strike the keys) the lighter end is very easily controlled because it pivots on a rounded surface, and will quickly redistribute the weight when the heavier person gets off. This is the essence of Steinway’s Accelerated Action. The results are such that the keys of a Steinway move free of friction, meet no resistance when depressed or upon return, and have a quicker rate of response. The other part of this equation is the weighting of the keys. Steinway keys are hand weighted, and the larger weights are placed closer to the balance rail bearing to allow the keys to return as fast as possible. Many people wonder why other manufacturers don’t employ the same techniques, and the answer is simple; it requires more time, and more work. Because the Steinway action has a more sensitive pivot than the action of other brands, all other action-related regulation is also more sensitive. 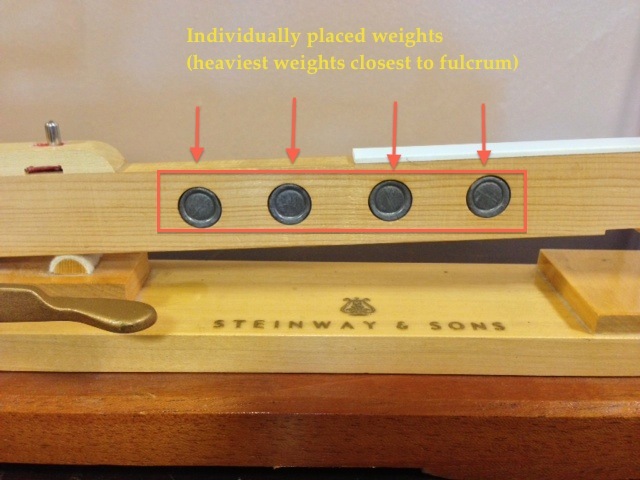 For example, the weigh-off process (lead weights are put in the keys to meet downward and upward pressure requirements) becomes extremely sensitive, requiring every key on a Steinway piano to be individually weighed off – a remarkably time-consuming process.